Mint condition frame and fork. I actually own the Red one! any idea where i can find a moosegoose frame and fork; i want to start to rebuild the one i was not smart enough to keep. Why doesn't anyone make this bike today?????? I guess all the big boys want Cruisers instead of a gangly looking 20". I am with the Pinto, Pacer, and Gremlin crowd, and this bike is cool as mierda! those are just hilarious to me in person. The headtube is so frickin' tall it just cracks me up. Pics are one thing, but in person it makes you laugh. The head tube and seat tube make the rest of the angles look wonky...yes wonky...lol it's actually sort of upsetting, I'm not sure if I should laugh or cry. Either way it's different and has a beautiful finish. I need a pair of 29er forks. 43rd birthday,and just got another one!! loooks to have new style graphite tuffs, sweet original fram forks and bars!plus a sweet old tuf neck! Congratulations on the score and happy birthday. I picked up a 1988 royce union and a kent fusion 5 speed bmx on my birthday...oh well maybe next year, eh? Gary, if you run out of space to park those bikes, I can "hold" onto the Moosegoose fer ya. LOL! Are you saling either frame red, or chrome? I remember those.. like to see an old school table top busted out with one of em'. Chrome one was delivered to thailand! not mine now..
Red one is still NOS.. so just sitting around...dont want to look at it to hard, might chip orig finish! 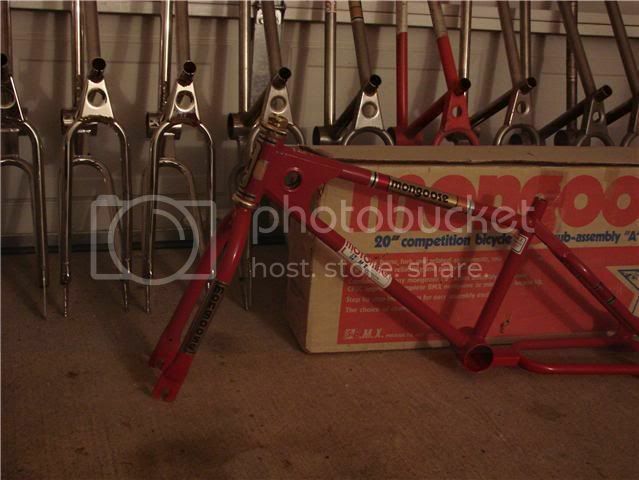 Funny, I have a 1980 Mongoose frameset that is also NOS (with the box) and the red is pretty similar to that Moose. The picture here is a little dark, but it's really close! I had a chrome Moose that I actually found curbside back in the early '90's. I traded it out... stupid like, for a mini F/F, for my son. I agree, the candy finishes on these were great!! ISO GOLD ANO FMF! WILL PAY UNTIL ACCOUNT IS EMPTY. I always leave feedback,,,why don't you? ?